Learn how to install CA-SiteMinder Web Agent and configure CA-SiteMinder Objects. Agent Group Named soaws-grp and containing the new soaws-agent agent. Adding an Agent Group is optional. Named soaws-domain. Configured for the User Stores that your organization will be using to authenticate end-users. Create a Host Configuration or verify that one is already defined. Launch the CA SiteMinder Administration Console. Enter the name of the host machine. Click Apply, then OK to continue. Enter the name of the agent (e.g., soaws-agent). Select the SiteMinder agent type. You can add the Agent to an Agent Group. This step is optional. Enter a group name (e.g., soaws-group). Select the CA SiteMinder agent type. 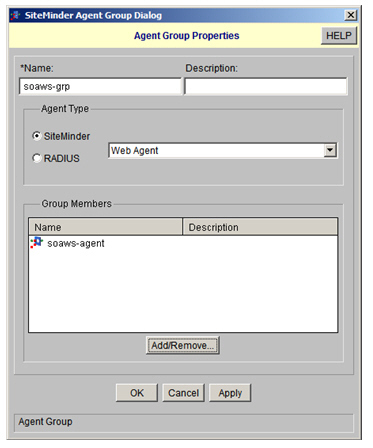 Verify that the group member matches agent specified in the previous step (i.e, soaws-agent). 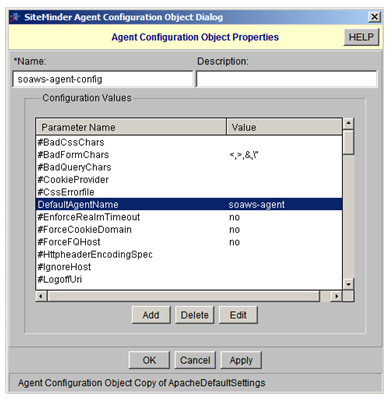 The Agent Configuration Object must be the default Agent Name or a list of Agent Names. The Agent Name parameters are used to map Agent Names to specific hosts within a single Agent Configuration Object. Set the DefaultAgentName property to your agent above (e.g., soaws-agent). This task should be performed once per "integration" versus once per agent/host. In the SiteMinder Administration Console, click the Domains tab. Right-click on the Domain you would like to configure. 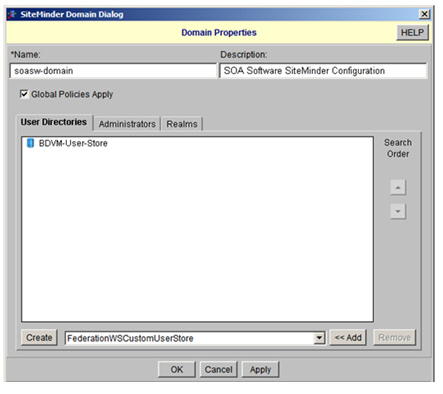 The SiteMinder Domain Dialog > Domain Properties screen displays. Set the user store your organization will be using to authenticate users. 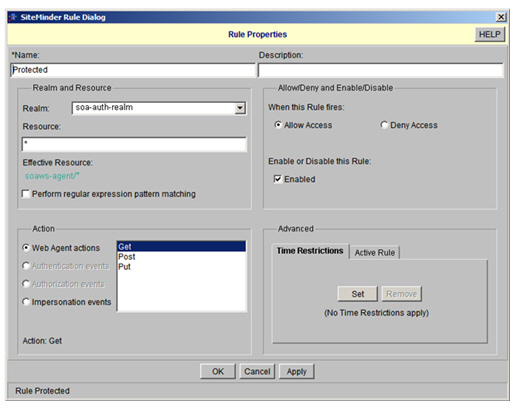 On the SiteMinder Rule Dialog > Rule Properties screen, select the realm from the drop-down menu. Configure the remaining screen options as illustrated in the screen illustrations below. 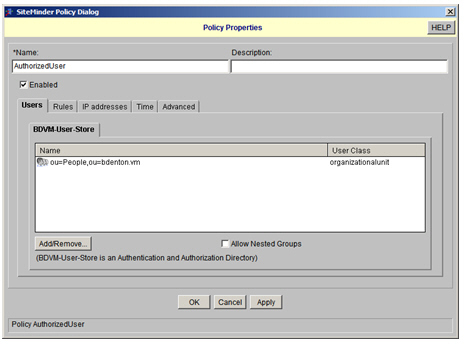 On the SiteMinder Policy Dialog > Policy Properties screen, use the Add/Remove button to select the user group and rule to use. 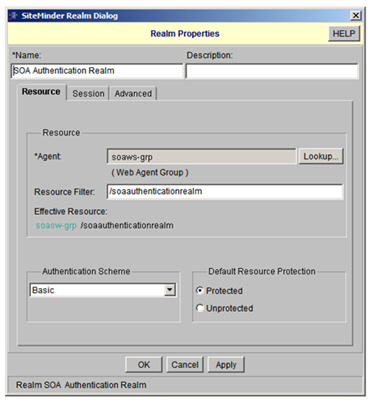 Create an SOA authentication realm under the same domain. Set the resource filter to /soaauthenticationrealm (which will be used later).